We are Lake Norman's source for quality BMW service and repair. 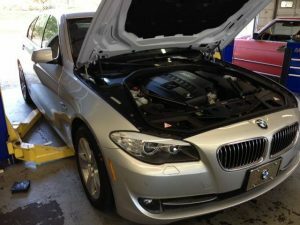 BMW 5 series (F10) getting serviced. We handle service and repair on all years of BMW, from early E30 chassis to the most current "F" cars. Getting your BMW serviced at Autohaus Lake Norman will not void your factory warranty. All of our tools, chemicals, procedures and parts exceed factory specifications, of not already from the factory. BMW 3-series (E90) getting software update after component replacement. 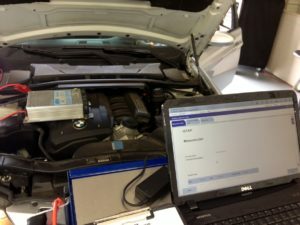 Using factory hardware/software that links directly to BMW North America, we have the same diagnostic and programming capabilities as the dealer, at a much lower cost. Our commitment to having the right tool for the right job reduces misdiagnosis and makes sure we are never obsolete so that we can always fix it right the first time. Eccentric Shaft Sensor on a BMW N52 Engine. 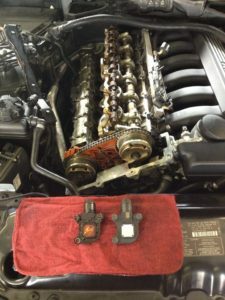 Not only do we excel in electrical and diagnosis, but we also have all the BMW special tools for doing mechanical work as well. These engines cannot be properly assembled without the correct camshaft alignment jigs. 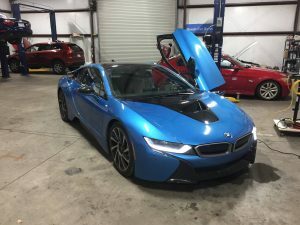 We work on the newest BMWs, like this i8 getting a diagnosis done on its very advanced electrical system.